Is Sweating For Weight Loss A Bad Idea? If you are struggling with your weight, chances are you’ve thought at least a couple times about sweating it out. This has been done multiple ways, and is very popular among wrestlers and fighters cutting to make weight. You have seen time and again people on the treadmill or elliptical with trash bags taped around their body, or wearing that full body nylon ski suit to really get their sweat on. However, based on the title of this article you are probably wondering if the average person should be sweating for weight loss. Let’s start by talking about why we sweat, the benefits of sweating, and the drawbacks of excessive sweating. We can then relate this more directly to weight loss because we can then fully understand the process of sweating. 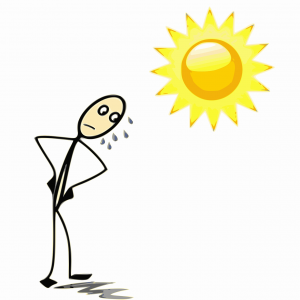 Sweating can be triggered by many different things such as adrenaline, stress, anxiety and hormones. However, when we talk about sweat and its relation to exercise or fitness we are generally talking about body temperature. When your body temperature begins to rise your nervous system responds by activating specific glands that then allow you to sweat. Sweat is our body’s primary cooling mechanism/strategy. Sweat can also release many impurities and toxins in your body. How much you sweat is based on all sorts of things and can even simply be genetic. In fact, there is a common misconception that out of shape individuals will sweat faster than those who are physically fit. This is actually not true because as your body becomes more used to the physical activity it understands that you are going to be performing rigorous exercise regularly and your metabolic process becomes more rapid. Therefore, at the beginning of your workout you may notice immediate or prompt sweating in anticipation of the activity to come. This means that your body understands your level of physical activity and allows you to begin sweating almost immediately. When you start sweating faster your body cools down more quickly leading to an increased ability to exercise harder for longer. This promotes muscle growth and muscle building especially when you properly hydrate before, during, and after your workout. Sweat consists of majority sodium and water. Therefore, if you are not properly hydrated or have not consumed the recommended levels of sodium in a day then you may not sweat at all. Not sweating can be detrimental to your workout and health because your body temperature rises with no cooling process to stay regulated. There is another type of gland that actually produces the bacteria that helps to break down the sweat after released. This bacteria is what causes body odor and the reason that we wear deodorant (hopefully). So What’s The Problem With Sweating For Weight Loss? Simply put, sweating for weight loss is not burning fat which is probably the true goal of weight loss. Yes your body gets hot, and maybe burns more calories. However, dehydration has much deeper problems than you realize. Essentially if you are working out while overly dehydrated you may just be destroying your muscles and making yourself even more prone to injury. Water is a key building block for our body, without it, muscles will not properly grow and recover. By forcing yourself to sweat heavily during your workout you are simply depleting your water table and key electrolytes/sodium that your diet has provided you all day. This is where you see all your weight loss, not through body fat disappearing. When you don’t consume enough water in the first place, you can suffer from severe dehydration. When you sweat too much, the same thing can happen. After sweating out all the water you have maintained in your body from proper hydration you have no sweat left to cool your body. This can even lead to full on heat exhaustion without proper water consumption during the workout. While you may drink plenty of water during your workout, you may not realize that you are just replenishing all the water you just loss and therefore the weight loss aspect of things will not provide ideal results. I personally can fluctuate up to 7 lbs in a day strictly based on water intake. The more hydrated I am the more I weigh, this is partially why I track my weight every morning rather than afternoon after I have been hydrating all day long. Fighters as mentioned above can drop 10-15-20 pounds in a day in order to make weight by over sweating and dehydrating themselves temporarily before weigh in. This is not a strategy that should be used for burning fat though for regular people. Hopefully the idea behind burning fat is to be healthier and live longer, not look a particular way. However, whatever your reasoning is, don’t use sweat as your weight loss technique. Adjust your diet, maybe take on the Paleo Diet as I discussed in a recent article. Good luck to you on your journey to weight loss and keep up the good work. If you have any questions feel free to leave them in the comments below or email me at dalton@incitefitness.org. I’d be happy to help in whatever way I can. Thank you for all the great information on sweating! It is easy to fall prey to the devices and fads that say sweating will increase our weight loss. I appreciate the work you put into educating us. Thanks for reading. It really is easy to listen to all the bogus you hear out there. That’s why I’m here! Sweating may not be the worst thing if it comes naturally while working out, but using it as your weight loss method is definitely a bit skewed. I am glad that what I do is appreciated it means a ton! OMG, I’ve always focused on trying to sweat it out. How wrong was I, your site was so informative. I’ll start focusing on burning vs sweating. What are your thoughts on the low carbs to no carb life style? I think it’s all about HOW you consume carbs. I generally cut out a large majority of grains but I still do get some macros. I try and avoid added sugars and carbs that are blatantly bad for you, and I know many people that have great body proportions through cutting out all carbs in the evening or at certain times throughout the day. Glad I could help with some quality information! Thanks for reading. Been looking for something like this for awhile now as I’m always thinking “sweat is great” and also a base for losing weight, but I guess I was wrong. We can really lose weight without sweating then, right? Makes a lot of sense man and now I look at exercise and weight-loss differently. Glad reading helped! You really can. 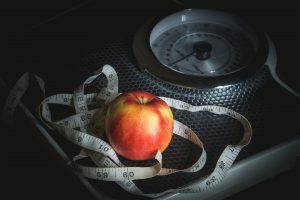 A large majority of weight loss is actually diet. People don’t realize that is where true change starts. In addition, consistent exercise vs. sporadic periods of exercise will be much more beneficial as well. Hopefully that sheds some light on it. Thanks for reading! You obviously know your stuff. I have heard of fighters etc. Sweating to make the target weight before a fight, this is obviously a short term solution just to weigh in at the target weight pre fight. I didn’t realise some people actually consider this technique as a long term weight loss solution though, so good job on setting the record straight. I appreciate you saying that. I do like to thoroughly research topics before I just spill my words about them. I’m glad to see that you understand it as a short term solution, but many do not. Great article Dalton! I am over 45 and work out on a daily basis. I used to think that extended periods of time on the elliptical while sweating profusely was the best workout for me, however after some research of my own I’ve discovered that for older men over 40 it actually works the opposite for us. I found that extended periods of cardio actually causes our testosterone levels to take longer to rebound, usually about two days. So, I’ve incorporated 10-15 minutes of cardio on the stairstepper just to get my heart rate up and then I get into my workout. By doing this, I haven’t noticed a significant weight drop but the proportioning of my body mass is moving in the right direction. So do you know of any truth behind my earlier comment about extended cardio and the testosterone levels in men over 45? Thanks for the article, it was very enlightening. I’m glad you enjoyed the read. Hopefully it offered some helpful guidance for you. I can’t say that I have experience struggling with the 45+ age range and I haven’t really done much research into the effects of extended cardio on testosterone levels. This is definitely something I’m now interested in and an article on that will be coming down the line as soon as I can learn my fair share. 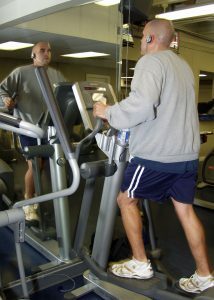 That’s awesome that you’ve figured out a way to incorporate some cardio for heart health but are still managing to keep those testosterone levels where they should be, especially at 45 I know a lot of people that struggle even getting to the gym at your age so serious props for sticking to it and dedicating yourself to a fit lifestyle. I personally think that sweating it out is a terrible way to “lose” weight as it is only temporary. Once you start eating and drinking water again that which is lost will be replenished in do time. Professionals use this method as a way to lose weight before a fight not as a long term method of losing weight. I do believe it works but I do not think it should be used as the main source of losing weight. Dieting and Exercise, Positive Thinking and Belief are stronger then the sauna. I 100% couldn’t agree more. That really is my entire point behind the article and I’m glad you read into it and saw the message here.